Meritage Wine, What Is It? Perhaps you have heard the term Meritage Wine and have wondered what it means. Is it a "special reserve"? What exactly are the merits of meritage? These wines are a blend of Bordeaux varietal grapes. They are not to be confused with inexpensive blends of jug wines. Meritage wines use specific grapes, and wines are made in the Bordeaux style. In types of red wine, sone of the grapes used are: Cabernet Sauvignon, Cabernet Franc, Petit Verdot, Merlot, and Malbec. 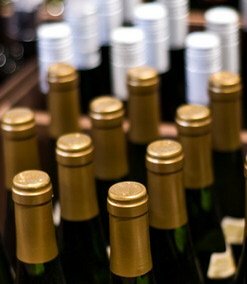 In types of white wine, the grape varieties are: Sauvignon Blanc, Semillón, and Sauvignon Vert. These wines were first made in Napa Valley in the mid 1970s. Joseph Phelps Winery believed that they could make a great wine by blending with less than 70-75% Cabernet Sauvignon. The idea caught on with other Wineries in the Napa Valley, though these wine are now produced in other areas of the United States, and other countries as well. White Meritages are made up of: Sauvignon Blanc, Semillón, Sauvignon Vert, with no grape variety making up more than 90% of the blend. This term denotes a type of blend that represents a high degree of winemaking skill, rather than common, and inexpensive, table wine blends. The name itself is a blend from the words "merit" and "heritage". Some well known wines are Opus One, Insignia, Rubicon.